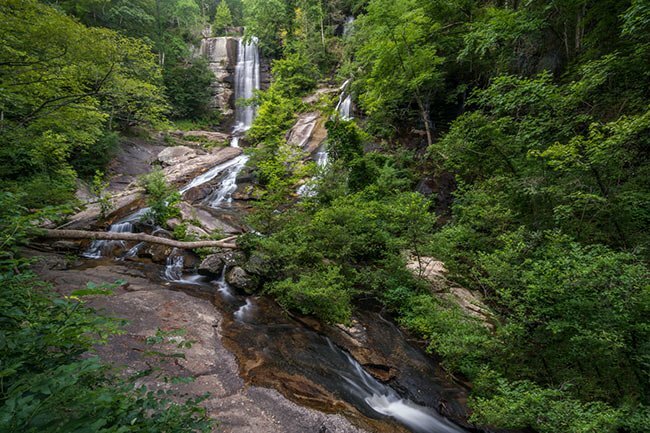 Twin Falls in the Pickens County community of Sunset is by many accounts the most stunning waterfall in South Carolina. It is also the most easily accessible. 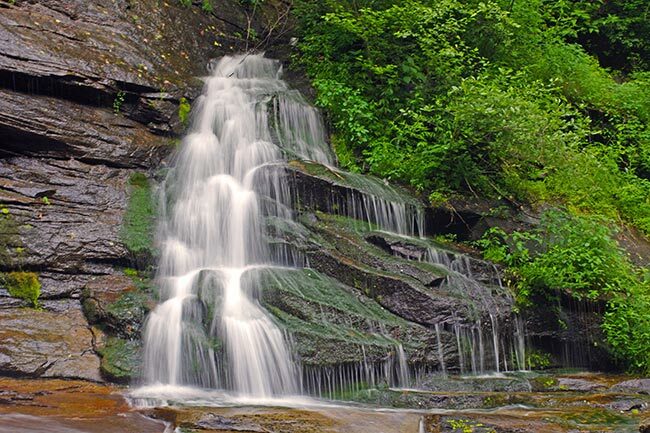 Tucked in the Eastatoe (pronounced “EAST-a-tow-ee”) Valley, Twin Falls is part of a private, 25-acre nature preserve purchased in 1984 by the Florida-based Felburn Foundation. Admission is free and visitors are welcome! 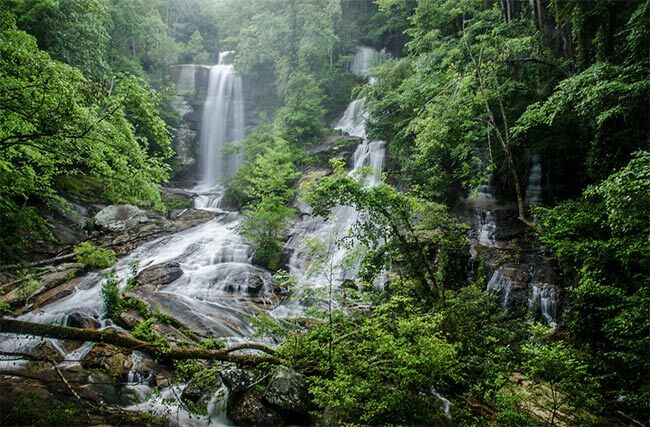 Oddly enough, Twin Falls – also called Eastatoe Falls, Reedy Cove Falls, and Rock Falls – could really be called Triplet Falls, at least during the times of year when precipitation is high. Once the mountain snow melts and the spring rains fall, a third waterfall appears to the right of the middle fall, as seen in the image above. This waterfall is smaller than its more permanent peers. The two main falls differ substantially and offer the chance for viewers to observe, from a single vantage, both a vertical cliff fall and a rolling boulder fall. The left fall plunges over a sheer 75-foot granite face, and the right (or sometimes middle) fall starts with a short, straight drop before cascading down a 45-degree slope. 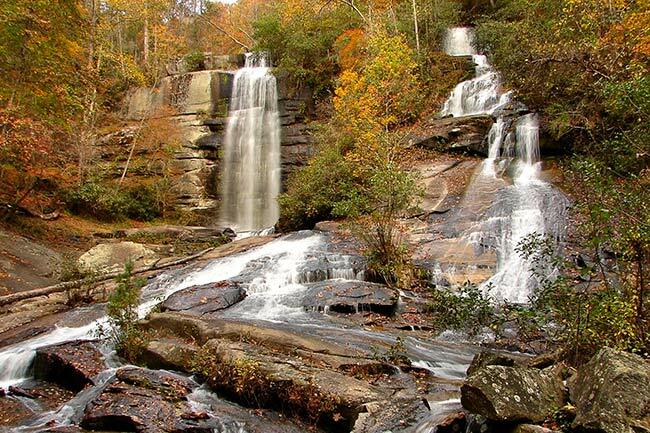 Reedy Cove Creek feeds both (or all three) waterfalls and rejoins at their base in several large pools. Further down, Reedy Cove Creek merges with Eastatoe Creek in the Jocassee Gorges. There are actually two separate trails to the falls, and in fact, finding the entrances to these trails is pretty much the only difficult part of the entire experience. Because the falls are private, they are not marked by official signs, which can lead to some confusion. We give directions in great detail below, but in the meantime, read on to learn about both of the trails to Twin Falls. By the way, Eastatoe is said to be Cherokee for Carolina parakeet, a native bird that is now extinct due to deforestation, hunting, and capture. Eastatoe also doubled as the name of a Cherokee tribe based in this area. The entrance to Upper Twin Falls comes first, assuming that, like most people, you are traveling from US 178. A path built in 2008 leads hikers on a roughly one-mile trek to the top of the falls. (The trail is 2.3 miles there and back.) 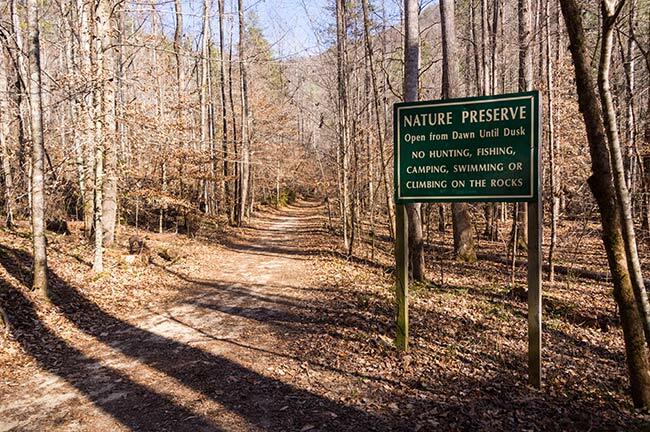 Because the route follows Reedy Cove Creek as it bubbles along, visitors often find themselves enjoying the journey just as much as the destination. As mentioned, one of the best parts of the Upper Falls Trail is being able to enjoy Reedy Cove Creek as it meanders alongside you. 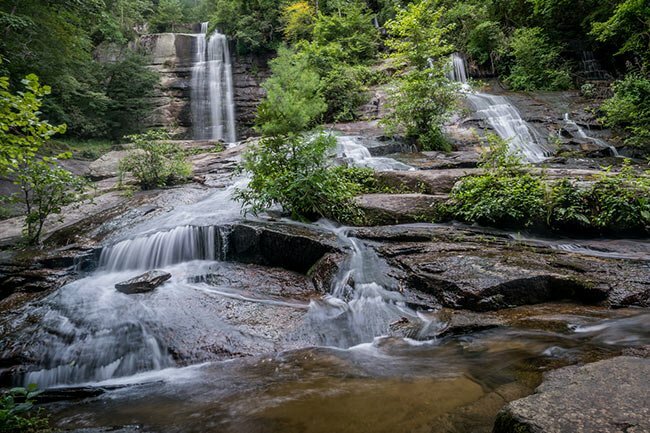 The creek features several gentle but significant cascades, which offer an abundance of photo opportunities. In the spring, this area is known for wildflowers such as trilliums and bloodroot. You will find a wealth of indigenous flora year round, including beech trees, dogwoods, old-growth eastern hemlocks, hickories, magnolias, red maples, black locusts, and oaks (chestnut, red, and white). The chance to see the rare tunbridge filmy fern, which is found nowhere else in North America, is a special treat. [The trail] was built in 2008 and follows roughly the path of an old Appalachian Lumber company narrow gauge logging rail line. In fact, at various points along the trail, you can still see portions of the old steel rails sticking out of the ground and portion of where the old railbed cuts through the hills. A series of violent storms and floods washed out the trestles and much of the track in the 1920s, and it was never rebuilt. Eventually, Appalachian was bought out and became a subsidiary of the Singer Sewing Machine company. Trees logged from the mountainside (then transported by truck rather to the main rail line) were used to build the cabinets of sewing machines shipped during the early part of the 20th century. Incidentally, David’s entire entry on Twin Falls is excellent and well worth the read. Note: The top of Twin Falls almost always has fewer visitors than the bottom, but the out-of-the-way location of both falls ensures that neither become overcrowded. 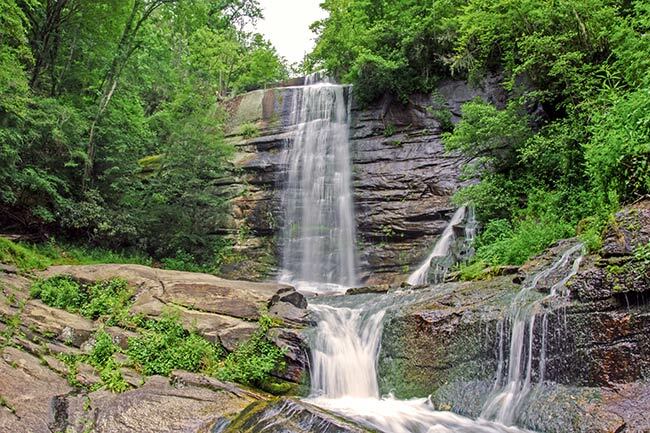 This hike, which takes just minutes, is so simple that it sometimes disappoints more athletic visitors, so if you want to get a bit of exercise, be sure to take the Upper Falls Trail too, which offers more slope. Nevertheless, the wide, flat trail to the bottom of Twin Falls is perfect for young kids, elderly people, and those with disabilities. Reedy Cove Creek runs about 10 yards to your right as you hike, which makes the short path especially pleasant. At the base of the falls, you will find a covered pavilion with wooden benches where you can rest and reflect. Although there is a sign stating that fishing, swimming, and climbing are prohibited, many visitors take a dip or explore the various slabs and rivulets that layer the bottom. There are no restrooms or trashcans at the falls, and no camping is allowed. On the plus side, dogs are welcome. 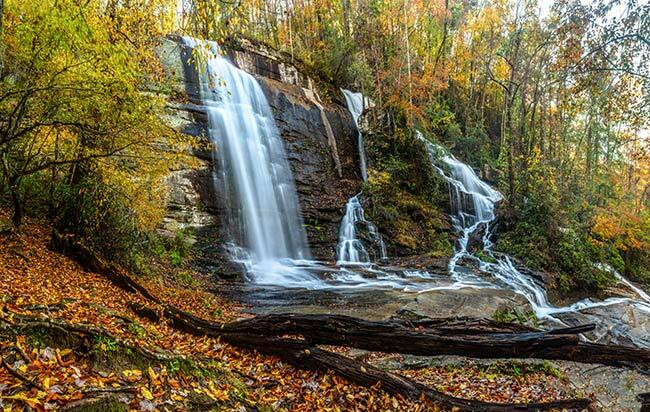 Eastatoe Valley is one of the best places in South Carolina to watch the leaves change. There is a trail to the left of the falls that leads up to the crest. This trail is steep and muddy and treacherous. People climb it, but it is not safe, and we advise strongly against it. 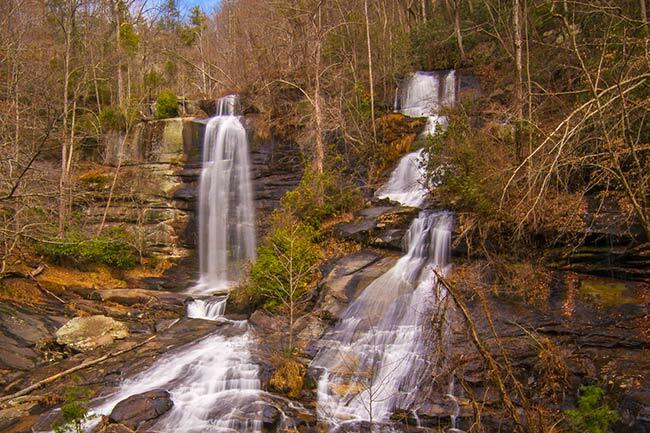 Here at the South Carolina Picture Project, we find the story of Twin Falls incredible. There are very few privately-held places in our state, or the country as a whole, where visitors are allowed to freely roam. Public access to Twin Falls began with a man named Phil Felburn, an Ohio native who made millions after founding Aetna Freight Lines in the 1930s. He purchased the falls and surrounding 25 acres in 1984 – for no other reasons than to keep them safe from development and to allow people to enjoy them unimpeded. Together, the two would scour both of the Carolinas (and Georgia) for spots to save. Felburn’s list of philanthropic accomplishments is long and includes donations to many libraries and colleges, in addition to natural landmarks, specifically across the Southeast, but even as far away as the North Pacific Coast. Incidentally, the first President and Chairman of the Felburn Foundation lived right here in South Carolina, in Loris (Horry County). His name was Charles Freeman and he ran the nonprofit for nearly 30 years. In the fall of 2011, the Feldman Foundation donated a conservation easement for Twin Falls to The Nature Conservancy. Now for the hard part! Just teasing – getting to Twin Falls isn’t too tough as long as you keep your eyes out for a couple of key landmarks. 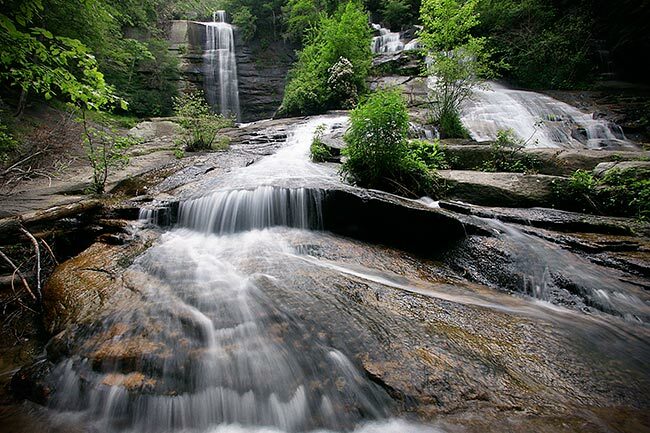 Remember that there are two separate trails to Twin Falls – the Upper Twin Falls Trail and the Lower Twin Falls Trail. Both have their own small parking lot, and both can be darn near impossible to find! 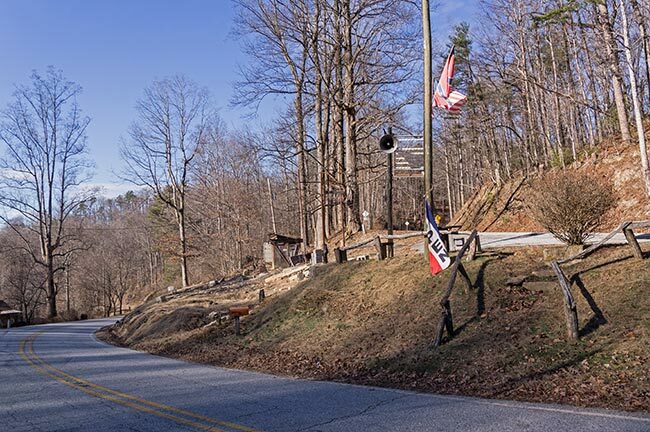 To reach either trailhead, you will need to start on US 178. This road (which begins in the Lowcountry) runs through Pickens and Sunset and then crosses the state line into North Carolina. 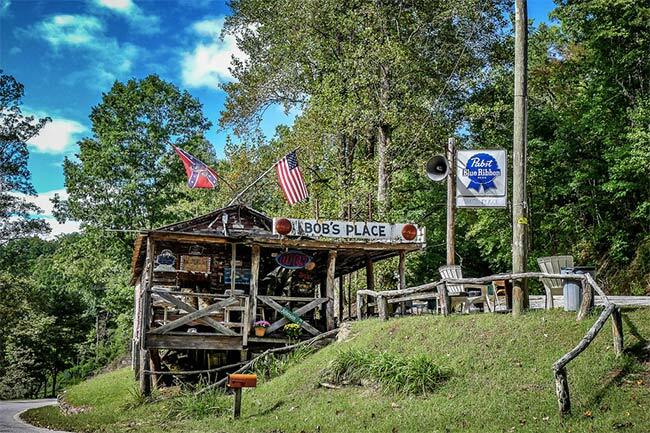 No matter which direction you are coming from, you are going to need to look for the former site of Bob’s Place, a legendary local tavern that burned to the ground a few years back. This will be your first major landmark. Update: Bob’s Place has been torn down, but vestiges of it remain, including the Road Kill Grill and a graffiti-covered shed. Once you spot these relics, you’ll know you’re on the right track to either of the Twin Falls trails. Depending on how you’re headed, you can turn right at Cleo Chapman Highway or just continue on ahead, as US 178 will effectively merge into Cleo Chapman at this location. Drive down Cleo Chapman until you wind your way through a hairpin turn. It’s preceded by a warning sign. Up next, on your right, a neon yellow marker alerts you to a school bus stop. After you see this marker, you’ll come to a small clearing with two houses on the left. Start slowing down. After this clearing, you’ll come to a green Adopt-a-Highway sign on your right. Immediately before that sign, turn right into the parking lot. This is the start of the Upper Twin Falls Trail. There is a red swing gate and a small green sign up in a tree. It reads “Twin Falls,” but boy is it tough to see. If you pass the Adopt-a-Highway sign, you’ve gone just a few feet too far. Happily the trail to Lower Twin Falls is relatively simple, at least by comparison. You simply continue down Cleo Chapman Highway until it comes to a “T.” Cleo Chapman carries on to the left, but you’ll want to turn right onto Eastatoe Community Highway (Pickens County Road S-39-92). Eastatoe Community Highway is the site of a community farming cooperative so you are going to pass plenty of fields. 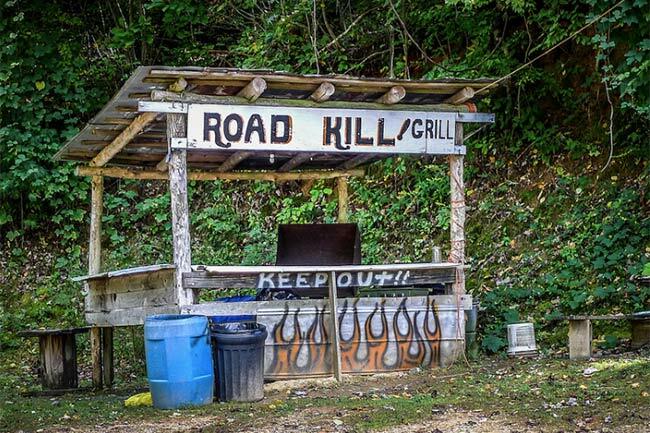 You’ll see a “Dead End” sign, but don’t let that stop you. Shortly after you cross a small, unmarked bridge, you’ll come to a tiny little road off to the right labeled “Water Falls Road.” Turn here. Water Falls Road will briefly become Holcombe Hollow before resuming its original name. Nevertheless, just follow the road as it makes a sharp left turn. You will end up in the parking area for the Lower Twin Falls Trail. 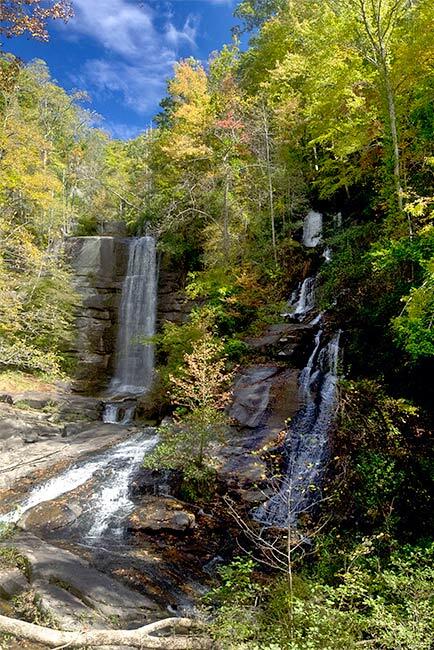 Please note that there is another Eastatoe Falls on the other side of the South Carolina-North Carolina state line. 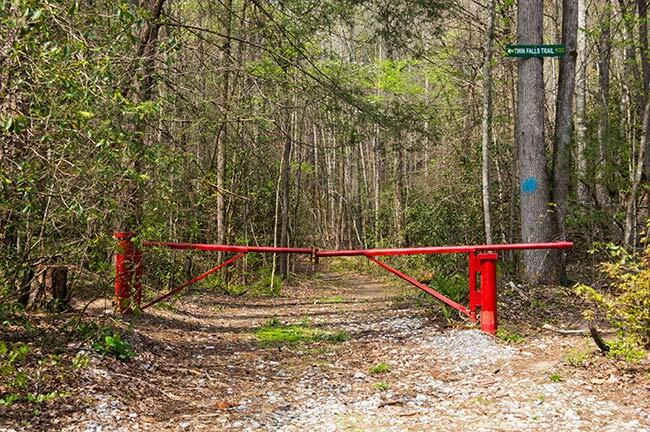 It is located on private property off Old Rosman Highway south of Brevard. 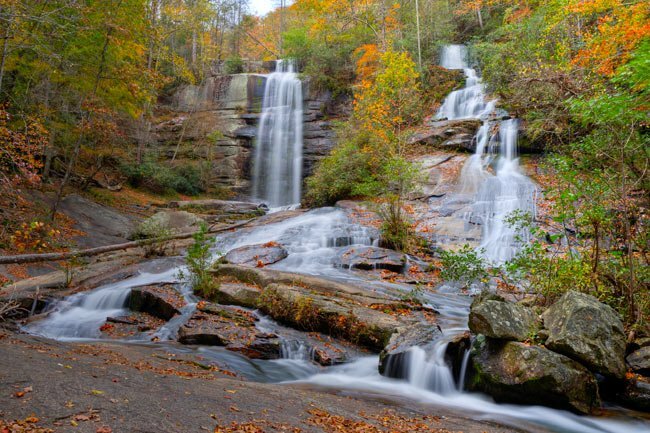 The Eastatoe Falls in North Carolina is fed by Shoal Creek, whereas the Eastatoe Falls in South Carolina is fed by Rocky Cove Creek. Tour group interested in visiting falls. Great grandparents were from Walhalla. Sounds wonderful, thanks for the detailed information. Aw bummer, we wish you had known about us before but we are so happy to hear that you’ll be returning and will have info you need to make it a better trip, hope you have a great time! Love it! 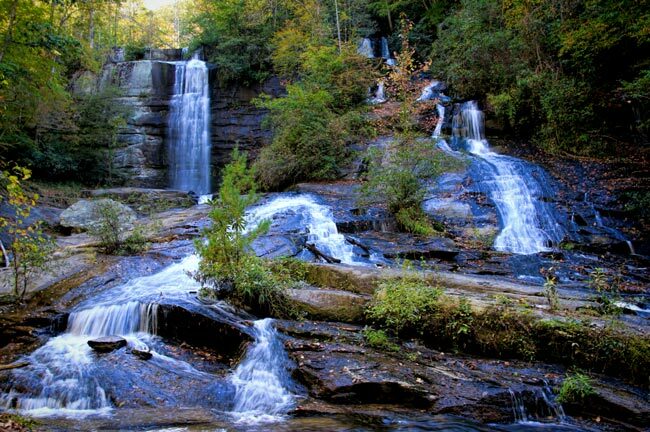 I’m originally from SC and never knew we had waterfalls. Just there and wish I had this info. I plan to visit the falls in my next trip home! My great, great grandfather, James Roach, lived in this area in 1850. His wife, Elizabeth, had 6 children. What a beautiful place to raise a family.